New Delhi: Pod taxis, an idea with which Indian states have flirted for years, will finally debut in Gurgaon. The National Highways Authority of India has laid the groundwork to roll out India’s first personal rapid transit (PRT) network and will invite global bids for the project within the next fortnight. The pilot project will span a 13km stretch from the Gurgaon-Delhi border to Badshapur Mod on Sohna Road and is estimated to cost Rs 850 crore. 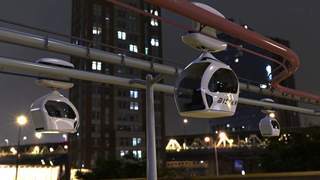 A project called the Metrino (in pic) -a PRT system in which pods are suspended from an overhead rail -has been under consideration for a while. Every pod can take up to five passengers. For the pilot project route, 16 stations have been planned, starting near Ambience Mall. A personal rapid transit (PRT) network is made up of small automated vehicles running at close intervals on a guideway with docking stations for passengers to get on and get off.While a pod can accommodate up to five people, there is also an option to hire an entire pod that will take a passenger straight to the destination, skipping the scheduled stops. The average speed of the pods is 60kmph. A senior NHAI official said the network would be built within a year of the contract being awarded. “Pod taxi systems are best suited for this. We are keeping our options open, though, so that private players can come up with best system, including skyrail,” the official said. A skyrail is also a PRT system, but is more similar to a ropeway . Union road transport and highways minister Nitin Gadkari had announced last year that Metrinos will run between Dhaula Kuan in Delhi and Manesar. The overhead network for Metrinos has been planned along the expressway . Prime Minister Narendra Modi had travelled in a pod in Masdar City during his last visit to the United Arab Emirates. According to estimates prepared by the NHAI, while building a kilometre of Metro costs at least Rs 250 crore and of monorail Rs 200 crore, the Metrino system can be built with just Rs 70 crore. It’s lighter as well. “The NHAI will roll out the project soon. We have set a target of a year. Subsequently , we could extend this to Dhaula Kuan and Manesar on each side,” said the NHAI official.